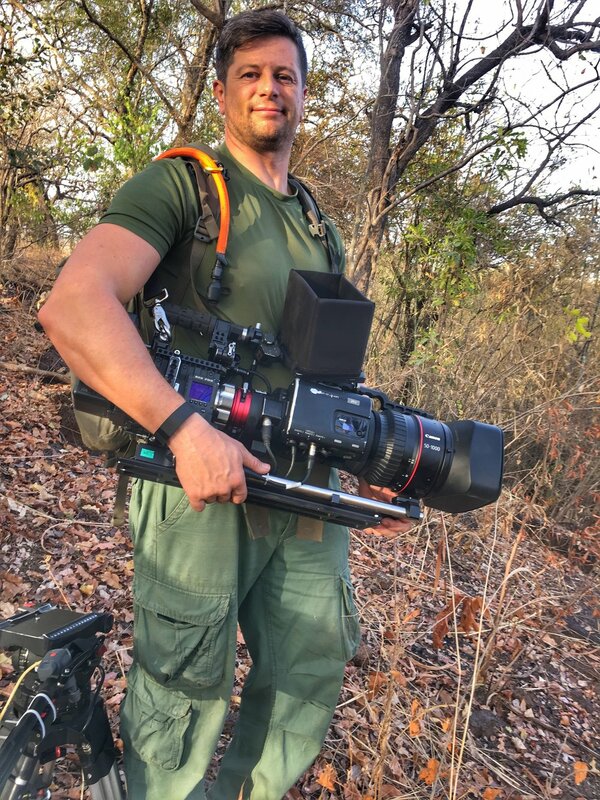 For much of the last 3 years I have been filming a new series currently called Dynasties, it is 5 x 1hrs for BBC1 starting on the 11th November, and for one of the films I took on the task of filming a program on Chimpanzees in Senegal and being part of another Team of DOP’s filming the Lion program in Kenya. Filming chimpanzees is no small undertaking, the last time I did was for a BBC series called Africa. I found myself in the middle of the Congo Jungle for 5 weeks, trekking the equivalent of a half marathon to full marathon everyday for fleeting glimpses of chimpanzees and losing 2 stone of weight in the process. So I thought about taking this film on with some trepidation, but they are such amazing animals it was a tough decision. There really is nothing like spending time with chimps, there are moments when you film them that you really see and feel how closely related we are to them and this was a chance to spend the next few years making a film documenting the drama unfolding of their lives, so I could really only make one decision and that was to accept. The chimps here unlike the ones I filmed before in the Congo, these live in a far more extreme environment. Unlike the Jungle of the Congo the environment here is far more Savana and patchy woodland, appearing far drier and less forgiving. But because of this they have lots of very interesting behaviour, from Spear hunting Bush babies to digging wells for water. But they can also move even bigger distances each day if they choose. Im no stranger to hard physical shoots and have spent many years in deep dark jungles or trekking in deserts to wading through waist deep snow in -35, but the first 3 days of filming these guys were the most sobering in my career. The days starts at 4am as you need to get to the chimpanzees before they wake up and move as it could take days to find them again and it ends when it gets dark. It was frequently over 40 degrees C, my Backpack weighed in at 33Kgs, holding camera batteries, water, food, lenses, and strapped to my front was a Red Dragon Camera with a Canon 50-1000mm lens. Those first 3 days i was physically broken and genuinely for the first time in my career i wondered if i could actually do this project, fortunately they took it slightly easier on me for the rest of that week and I got over the initial shock and was able to physically recover and carry on. That started the next couple of years filming. Often there were just 2 of us in the field day after day, Myself with the amazing Michel, he was a field assistant for the scientist who had been following these animals for years. An amazing man, he could recognise all of them often from a kilometre away just from the sound of their voice. without him none of this film would have been possible, he got us to places where we were able to see and film amazing behaviour. Filming chimpanzees is hard enough as you are often lagging behind trying to keep up with them, they cover the distances so much faster than we can, you don’t get the same opportunities as with many other wildlife subject of working the light angles with them as you are often lucky just to filming anything at all, and they have the uncanny knack of managing to place a branch or blade of grass right between their faces and the lens, sometimes it really not fair and i could have sworn it was deliberate :-). But we wanted to push the boundaries of how we can film these animals and bring their story and characters to the forefront. To do this my third shoot was all about trying to use the Freely MoVI with Red Dragon camera and try to follow them, I didn’t even know if it would be possible to be honest as the distances covered and some of the terrain makes doing it and adding cinematic movement to the film incredibly difficult. The Gimbal system has to be hand held and instantly able to respond when something happens. Its probably one of the hardest subjects Ive ever tried to use the MoVI with, chimpanzees go from fast asleep to marching you 10 miles in the blink of an eye, they can also be incredibly explosive, giving very little warning that something is about to happen and at that time of year the temperatures are brutal and from about 11:00 on most days are about 46 degrees, so I had my work cut out for me. But despite these challenges I believe we filmed some extordinary shots for the program, it wasn’t easy and they made us work hard for every shot, but to me it instantly felt different and new. We were suddenly going on a journey with these amazing animals, and the movement really allowed me to follow their story in a more immersive way and help their environment come alive on screen. Its been an extraordinary series to have been involved with and feels like an exciting change to the already amazing landmark series i’ve been involved with for the BBC like Planet Earth 2, BP2. Really following individual animals lives, through the highs and lows, some moments have been the most emotionally involving things i’ve seen and some of the very toughest to stay impartial about in my career. Returning each time it felt like you were coming back to old friends, as wed got to know the individuals characters, there are genuine moments when filming chimpanzees were you can feel a connection between you. One looking into your eyes while you look into theirs it makes the hair on the back of your neck stand up. I really hope we’ve done these incredible animals justice and you enjoy the series starting this sunday BBC1 11th Nov at 8:30pm. Im really pleased to let you know that a series i spent much of the last 3 years working on is going to be aired this Autumn on BBC1. Its really exciting for me personally as was in many ways one of the most amazing yet challenging projects to be involved with in my Career. I DOP’d the Chimpanzees film with John Brown and filmed on the Lion film alongside Sophie Darlington and John Aitchison. It is a five part series about the lives of these amazing animals above. Ill keep you posted about the release date ! April news 2017, Bafta winner. I was fortunate to be nominated to attend the Baftas for Cinematography along with John Aitchison and Rob Whitworth, for our work on the fantastic Planet Earth 2 'Cities' program. And am incredibly happy to report that amongst the 4 Cinematography finalists the Cities program Won. Its a was real honour to get up on stage and receive a Bafta, a true career Highlight. There were many very talented Cinematographers involved with the program, and it was beautifully produced by Fredi Devas and Edited by David Pearce. Me on the Left with Rob Whitworth and John Aitchison April 2017. For much of the last 3 years i have been filming on 'Planet Earth 2', a series recently aired in the UK and is airing in the USA on the 18th February 2017 on BBC America, AMC and Sundance TV. I was fortunate enough to work on 3 of the 6 programs in a large capacity, 'Islands' , 'Jungles' and 'Cities'. The series took me all over the world from Komodo island to the jungles of Costa Rica, Madagascar several times and India. On one of those occasions filming in Madagascar, I was lucky enough to spend time in the Mitsinjo Association in Andasibe. Home to one of the most amazing animals Ive seen in a very long time, which considering the diversity Madagascar has to offer is no mean feat. Its here that I met a Lemur called 'David' (named after David Attenborough). David is infact a female Indri Lemur, the Largest of the Lemurs left in Madagascar. Its one of the most gentle and inquisitive animals I've had the pleasure of filming. Indri are monogamous and live in small family groups, moving with amazing grace and agility through the canopy, feeding mainly on leaves but also seeds, fruits, and flowers. I was hoping to film them Calling in the forest, this generally happens early in the morning which is always a challenge in Jungle as there is often so little light at that time of day, also Jungle tends to have very thick canopy cover, so if they decide to call at the tops of trees you find yourself scurrying about the jungle floor with a 30kg camera kit on your shoulder hoping to find a small gap in the leaves big enough to film through. The Call when you hear it is truly amazing, unlike anything I've herd before, the closest sound i can think of is whale song its like a long cry through the trees, the first time i herd it, I was lucky enough to be very close to the group, it made the hair on the back of my neck stand up, gave me goose bumps and i stood there smiling in disbelief. Its such a haunting sound to hear when you are walking through a jungle, made all the more significant when you find out that in the past decade, half of the Indri families in Madagascar have disappeared due to deforestation. Indri also have the ability to move through the forest as if they are flying, with a single leap they can easily cover 10m, and it was another of the things we wanted to film for Planet Earth 2. To do this I used the Freely MoVI M15, a handheld piece of equipment which allows me to follow an animal and stabilise the camera at the same time. That makes it sound far easier than it is, it gets heavy quickly and to get the shots for the program took lots of time, sweat, a lot of blood shed to various insects but no tears. I had to try and predict the moment the Indri would choose to leap and try to time myself and the camera with it, while not falling over getting stuck on jungle vines and remembering to press record at the same time. Its slightly like an award ballet, the Indris movements are so graceful and mine so cumbersome in comparison, but when timed together hopefully produced some beautiful imagery. My hope in using the MoVi is to make the viewer feel like they are moving through the environment with the indri as much as possible. It makes filming feel more immersive in a place like this and gives me more creative freedom to use light and the environment. But trying to predict an indri jumping and then watching it leap 50m in around 2 seconds through thick Jungle is a real challenge and very daunting, there were times i did question what i was trying to do as I definitely can't move through jungle like an indri. But when it worked its was thrilling to be part of. I can't thank Rainer Dolch and the Team at the Mitsinjo Association in Andasibe enough, and they have done incredible work to re plant and conserve the rainforest and animals, and to be able to spend time with the Amazing Indri there felt like such a privilage , its one of those must sees for me. Look out for it in the opening to the Planet Earth 2 series and especially in the Jungles program. You can see a few of the shots in the trailer below. I was one of the Main cameramen for BBC2's Japan's Enchanted Islands / Programme 1: Honshu, and it has Won an award for Excellence by the Guild of Television Cameramen, many congrats to all on the team. John Brown, Graham MacFarlane, Mark MacEwen, Mark Payne-Gill Daisuke Semiya. I’ve been involved for the last year and a half in a fantastic new landmark series for the BBC called 'Planet Earth 2". It follows on from the original Planet Earth series which first aired around 10 years ago. It’s taken me to Madagascar several times, India, Costa Rica and Komodo. 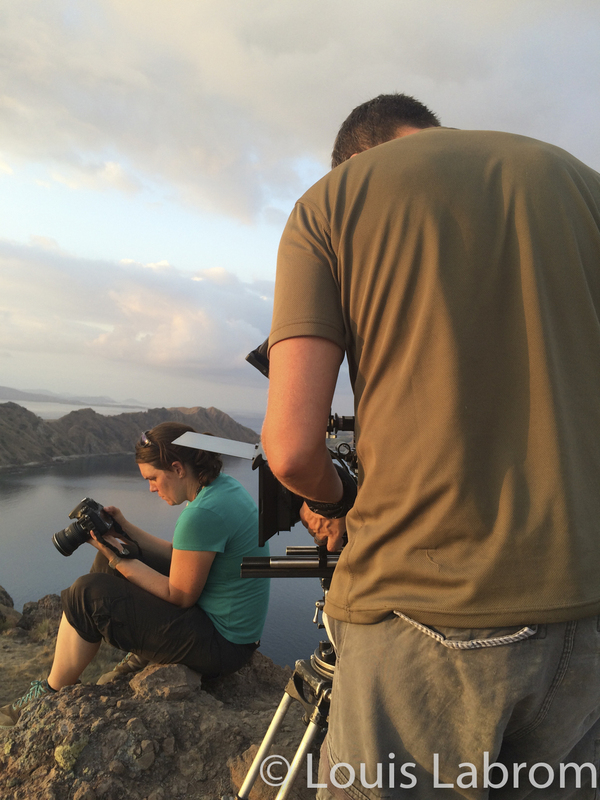 It’s the second time I’ve filmed the Dragons of Komodo Island and it’s a place that’s very special to me. As a child I like many others used to love reading about dinosaurs, I remember the first trip my parents took me on to the Natural History Museum in London and walking into the main hall to see the enormous diplodocus on display there and still think about it today and how it fired my imagination. I remember Reading Arthur Conan Doyle’s The Lost World and dreaming about one day experiencing such an adventure myself and for me Komodo is such a place. Padar Island with Komodo in the Background. 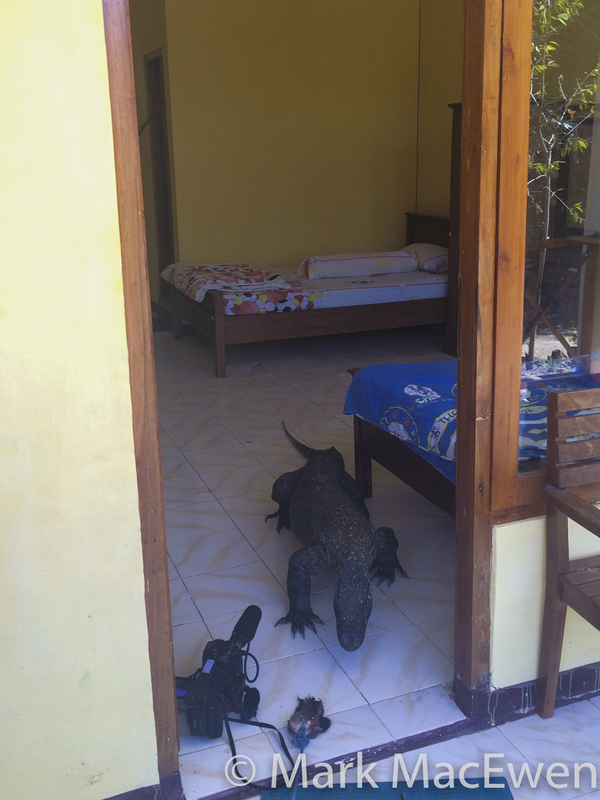 In order to prepare myself for the trip, I thought a little background reading about the potential hazards a Komodo dragon poses to a human might be useful and get the excitement levels up. I read various articles on the web, which made my eyes wider as I did more research. Just a few of the recent victims of Komodo dragon attacks included: an 8-year old boy; a group of stranded divers; a celebrity's husband. 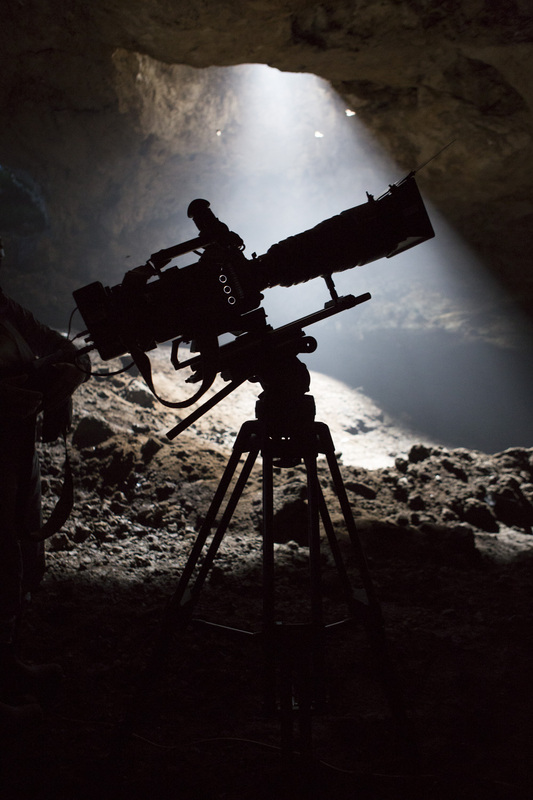 With this in mind, myself ( DOP ), Emma Brennand ( Researcher) and Louis Labrom ( Camera Assistant and Tech Wizard) set off for our trip at the end of July: our Mission - to film the Komodo Dragons fighting. It was coming to the end of the mating season the reports were good that the behaviour was still happening but we knew to film the spectacular fight we hoped for, we would need all the luck we could get. It took us 4 days, 4 flights, cars and a boat that was to be our home for the next 3 weeks just to get us to the island. But the journey is so worth it the moment you catch your first sight. When you approach the island on Boat it delivers all of those images I'd imagined, the prehistoric looking huge rocky mountains, strong ocean currents, whirl pools and you just know you are going to see something amazing. Our challenge would be to find two male dragons that were going to battle over a female. We had expected it to difficult as filming most animal behaviour is, but not as hard a challenge as it proved to be. The problem with Komodo in the breeding season is that the dragons disperse all over the island in pursuit of females and are much harder to find. But we had an amazing team with us of local Rangers and Achmad Ariefiandy a scientist who had been studying the dragon on Komodo and Rinca Island, without whom none of it would have been possible. At first sight the Komodo dragon is an intimidating animal, it is the largest living species of lizard, growing to a maximum length of 3 meters (10 ft) and weighing up to approximately 90 kilograms. The skin is like armour, teeth like a shark and pure muscle. It didn’t take long to get our first glance of a dragon walking along the beach and reminded me of the moment in the Jurassic park film when the glass of water ripples when the Tyrannosaurus rex approaches. You feel every foot step, the power of the dragon runs right through you, especially when you film them and have such close spine tingling experiences. It makes the hair on the back of your neck stand up when one stops close and sizes you up. It’s putting adrenaline through me now as I think about them and write this. All of us took a sobering breath, smiled in excitement, and started to plan our strategy for the next few weeks filming. Like many top predators there is a lot of down time, dragons, like lions and many others sleep a large part of the day, but when they decide to do something it looks great. I filmed as much of this sequence as possible on the Freefly MoVI M15, It is a stabilizing gimbal that I own several of and have been using for several years, that to my mind has no equal. I have teamed it with a Teradek Bolt Pro 2000 HD wireless system that is amazing, it gives astounding range and great picture quality coupled with the Small HD High Bright Monitor and i use it alongside the RT Motion Follow focus, the Follow focus has been fantastic and works brilliantly with the MoVI as the receiver is so small it adds no weight to the system and the whole Follow Focus is made beautifully and gives my focus puller the best chance to do his job. Sometimes you have to step away !!! MoVi M15 with Red Dragon, Teradek bolt pro 2000 and Rt Motion follow focus. The ability to get the range of shots it enables me to get has revolutionised wildlife filming recently, and from a style point of view suddenly allows the animal to take us on a journey, following its movements and life in an immersive and less strictly long lens observational way. It's added so much to wildlife filming styles and suddenly brings much more of a drama feel to wildlife. For the long lens work I used the relatively new canon 50-1000, its a monster of a lens and a beast to carry but the image it produces is stunning and there really is no equal at that focal length for this sort of work. Well that was a lot hotter and more unpleasant than we all expected! 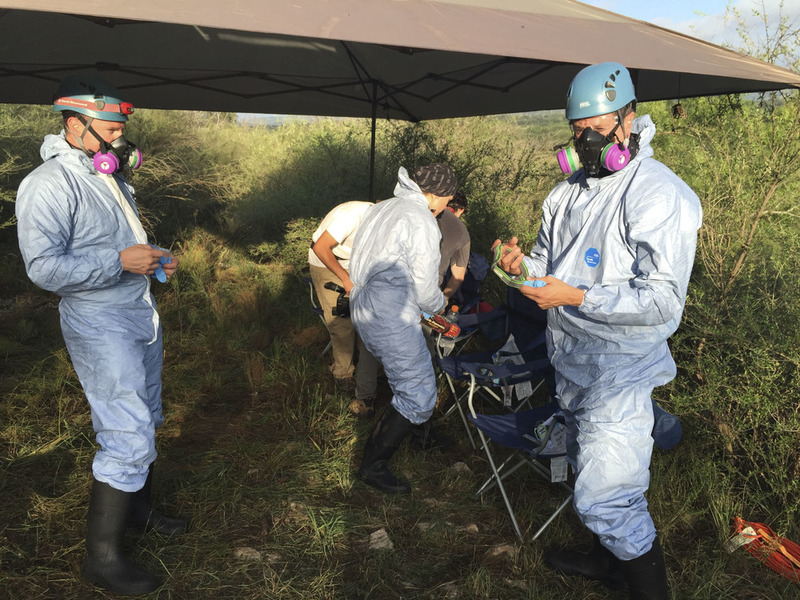 At the start of June I flew to Texas for a BBC1 NHU production called Life in The air, currently Airing on sundays on BBC 1 at 5pm, to film a sequence based on the flight and navigation of Mexican free Tailed bats. I have filmed them once before for a BBC series called 'Human planet' and it really is one of those sights that everyone should see. They are one of the few bats that emerge in the summer months often before dark in their millions, which does help for filming and you can watch the shapes snaking out over the horizon for miles, it is truly amazing. But the down side to filming these amazing creatures is that they live in caves where the inside temperature was over 40 deg C. Due to the fact that the caves contain histoplasmosis (a potentially fatal infection due to its fungus) we had to dress in full protective gear: essentially a full plastic suit, face masks, glasses, rubber gloves and boots. Highly unglamorous and sweaty as hell. It was some of the toughest working conditions I've been in for a long time. It's hard to describe what it's like spending time in that environment. An almost overwhelmingly strong smell of ammonia hits you first as you approach the cave, the next thing that you feel is the heat as you step in, then you start to sweat. This all happens before you realise that every bat you walk under is peeing on you, there are mites falling on you all the time and then you have the flesh eating beetles to contend with. The floor in the cave had a life of its own, if some unfortunate bat fell from the ceiling small flesh eating beetles would rush towards it keen to make it their next meal. And thats all before the technical challenge of working out how to film them had begun. It was an amazing place to be when the bats were leaving or returning to the roost, the sound of thousands of bats whistling past your ears and the occasional one crashing into your ears. I filmed much of this on and infrared converted Red Dragon, and I'm still amazed how well it coped at high frame rates in the infra red light. The bats' wings were translucent under the right lighting and looked stunning. 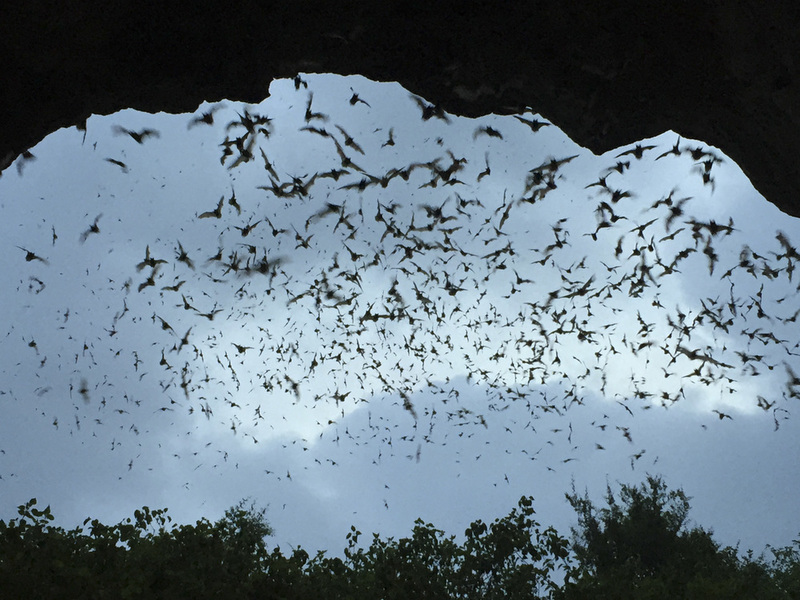 But for me, the highlight was filming the bats emerging at a famous cave called Frio, in Texas. It is vast. The first entrance is so big you could fit a 737 plane in there, it was perfect for our filming. There are estimated to be several million bats in that cave and the emergence is spectular. I had an Arri Amira and a canon 30-300 for the job and they didn't let me down. From where I was filming inside the cave I could see the huge number of bats congregating in the cavernous chamber before moving out to forage for insects. It was incredible, the sound of that many wings rushing around you and the moment they decide to leave the cave, the next spectacle starts as they snake across the landscape for miles. It was a great team to be involved with and needed all the hands we had to get the logistics, planning, Vast amounts of equipment, and the shear determination against the odds to make it a successful sequence, oh and the enormous amount of gatorade to keep us going!!! So special thanks to the amazing team : Giles Badger, Rachael Norman, Jo Stead, Nickolay Hristov, Lou allen, Isaac Banks, and Chris. Its been an amazing two and a half months filming from India, through New Zealand down to the Sub Antarctic Islands on its southern tip, and now I'm sat in an airport on my home to the family, cant wait, its been a long time. I just need to remember how to be a dad and husband again. Ive filmed Macaques, Langurs, Holi festival, Albatross, Tuatara (reptile, bit like a lizard), Giant Weta, Maori Wood carving, a sheep muster on some of the steepest mountains I've seen for a while, and finally Sooty shearwaters, its been a blast. We used every mode of transport i can reasonable think of other than a train, but cars, helicopters, planes of almost every size. Sheep Mustering as it turns out down here, happens just before winter sets in, the farm we filmed at has some of the most amazing scenery I've been in and Kate and her shepherds get dropped by helicopter to the top of one of the more impressive mountain ranges and over two days navigate their way through this landscape trying to bring down 7000 sheep from the steep summer grazing. All while wearing shorts !!!!! It was too cold for me to think about doing that. But the final part of the shoot was spent on a small boat in a large stormy ocean, trying to find the elusive Sooty shearwater before this amazing little bird starts it migration from the sub antarctic tip of New Zealand all the way to the California coast, a journey that means it covers roughly 47,000miles a year. The chicks spend all of there time in the nesting burrow until their parents leave without them and then embark on this amazing journey. We only had a few days to film them and spent the first day clinging onto the boat in incredibly rough seas, but Ive never seen the number of Albatross we had like that before, well over a hundred, Buller Albatross, White Cap and the occasional Southern Royal and all within touching distance. This was my first time in India and it did not disappoint, Ive been all over the world filming and the sights, sounds and smells of india are going to stay with me for a long time. Its probably the most colourful and sense assaulting place ive experienced, and ive got to say I loved it. I got slightly overexcited about eating curry for a month as well, so much so that i made it every day at home the week before we left, (my poor family), I hadn't quite thought it through, i was to be eating curry 3 meals a day for the next month. Turns out you definitely can have too much of a good thing !!! I was here for a BBC landmark series currently called ‘One Planet’, and we wanted to film two sequences on Urban Monkeys across india, Macaques and Langurs, and experience Holi festival. This filming took us from rooftops to ground level, suing long lens, MoVi and Cable Dolly, trying to follow our characters from Jaipur to Jodhpur. there is nothing like seeing your gear on a long rope suspended above a city to concentrate the mind. 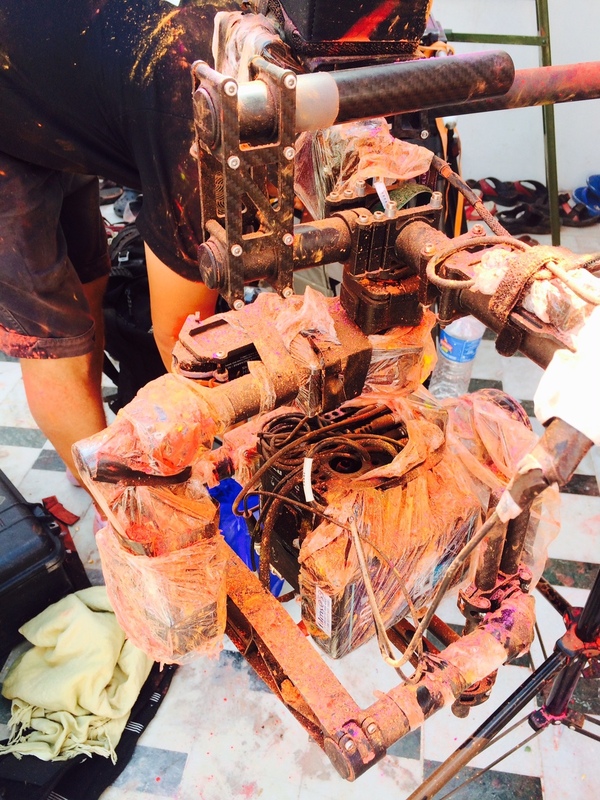 Holi came at the end of the shoot, which in many ways was lucky as having now experienced it, it definitely posed the greatest risk to the equipiment, I was falsely under the impression that Holi was all about paint powder, but it appears water has just as much of a part to play and its one of the main things that cameras and MoVI’s don’t like so myself and Louis Labroom came up with our slightly heath robinson Paint and waterproofing. Also we hadn't thought about the fact that the local children had also been planning for a long time their own plans for Holi, mainly focussing on water balloons filled with paint solution, fiendish !!! But we bobbed and weaved, duck and dived and took the occasional hit for the team and the kit survived, although has looked better. Telegraph Article: The challenge of filming in the wild. please click the link under the photo. This is a first Blog for me, and im currently in an airport on my way home from New Zealand where i've been filming for a new 3 part series for the BBC Natural History Unit, New Zealand: Earth's Mythical Islands. It’s a country i've always wanted to work in, with some truly stunning scenery. Its been an interesting trip so far, Island hopping between the North and South Islands. Filming on Rangitoto Island (a volcanic island in the Hauraki Gulf) opposite Auckland and Tiri Tiri. Its true what the Crowded House song says about new Zealand, Four seasons in a day, I've never been anywere where the weather is so changeable, it can go from very cold and torrential rain to bright sunshine in the course of an hour. But the main part of the filming adventure, was a trip to Snare’s Island on the TiriTiri Yaught skippered and crewed by Henk Haazen and Steve Parsons, a fantastic ship. Snares is a small island lying about 200 km south of New Zealand's South Island and home to the Snares penguin, the star of our sequence. Snares is down in the Sub Antartic and I had prepared myself for weather reflecting its location but we got lucky, the sun came out and turned it into a magical place. The Snares penguin is one of the only to nest in a woodland and it was our job to capture it journey from sea through forest to its nesting colonies. There were two main landing sites on the island, station cove and penguin slope. Station cove was truly the easier of the two and those penguins that were nesting near there had the easier time. Penguin slope however was a 200m slippery near verticle slope, which provided one of the more spectacular journeys ive seen. Ill miss the little guys as they were full of character and it’s a trip and place ill never forget.